Even as pre-season matches go, this one held at the 3G pitch at Netherdale left a lot to be desired. With Gala boss Steve Noble on holiday, along with several players, it’s difficult to see what either side took away from the match. Rovers, as a whole, worked hard, but the Lowland League men really should have been head and shoulders above the young East of Scotland development squad from Berwick. The 5-1 scoreline somewhat flatters the Gala men, who really only got into their stride in the latter stages of the game. Jamie Gibson’s 15th minute strike was the only difference between the sides at half-time. But Gala eventually pulled away with goals from Ryan Clapperton, Ross Aitchison, Dean McComb and Tommy Patterson, with Jack Hamilton scoring a consolation effort for the Berwick men. Gala coach Joe Brown, in charge for the day, said: “I think it was a good exercise. Meanwhile, Vale of Leithen seem to be struggling to get things moving. They took part in a tournament at Tranent at the weekend, losing 3-1 to Haddington (with former Vale man Wayne Sproule notching two late goals for the Hi Hi after Vale’s James Elliot cancelled out an early own goal) and 6-1 to Tranent. The Innerleithen men are due to play Penicuik Athletic on Tuesday, July 28. Hawick Royal Albert continued their pre-season trail on Saturday, with a hard-fought 2-2 home draw against Preston Athletic. They take on Gala Fairydean Rovers tonight on the 3G, which should be a good test of their pre-season fitness. 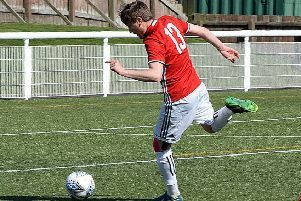 Peebles Rovers have been busy re-signing players – as well as bringing in a few new faces such as former Tynecastle and Lothian Thistle midfielder Brendan Edwards and ex-Selkirk and Berwick Rangers playmaker Stephen Anderson. Rovers beat South Of Scotland league team Lochar Thistle 5-1 at Lasswade on Saturday, but lost 4-1 to Lowland League side Edinburgh University midweek. Selkirk’s preparation for the season continued with a well-earned 2-1 victory over Thorn Athletic, an amateur side from Johnstone. And Kelso United made it two wins out of two in their pre-season with an impressive 5-1 win against Tweedmouth Amateurs at Five Arches.